It reads like an historical adventure novel, full of passion and swashbuckling romance. Yet Pirate Hunter is the true story of Captain Kidd, America’s more notorious and ruthless buccaneer. Through painstaking research, author Richard Zacks has pieced together the never-before-told story of Kidd versus Robert Culliford–of pirate hunter versus pirate. Captain Kidd was a successful New York sea captain, not a cutthroat pirate. In 1696, he set on a three-year voyage aboard the galley Adventure with a sometimes mutinous crew, heading 4,000 miles around the Cape of Good Hope at the southern tip of Africa to track down a handful of pirates and bring their treasures back to the governor of New York and a group of secret investors. Culliford, on the other hand, rose from Caribbean cabin boy to pirate captain, once capturing a ship in the Indian Ocean loaded with gold and several dozen wives and daughters of the local Moslem nobility. He divvied up both the gold and the women. This was an era of tall-masted sailing ships and lords in full wigs. The drama on land played out in the smugglers’ havens of New York City, Boston, and London. Zacks peoples his story with Royal Navy commanders, jealous East India Company captains, angry natives, and, above all, flesh-and-blood pirates. Hollywood couldn’t have done it better. His entertaining account of life of legendary seaman William Kidd tells how he was inextricably bound with piracy. 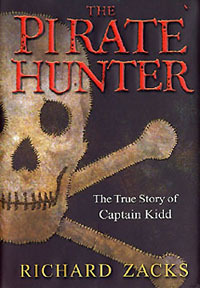 Zacks argues that Kidd was actually a mercenary backed by the English government and several New World investors to track down pirates and reclaim their stolen wares. What really sets the book apart is Zacks's gift as researcher and storyteller. He highlights the role of an undeniable pirate, Robert Culliford, in Kidd's story and pits the two men against each other from the outset, constructing his book as an intriguing duel. Besides giving his readers a tightly constructed plot, Zacks also takes them into the social and political life of the 17th century at land and at sea by filling his readers’ minds with the sights, sounds, tastes, and even the smells of that time while he debunks and validates pirate folklore. This is a surprising, eye-opening book that will completely change readers’ perceptions of what pirates might have been. As Zacks points out, Kidd wasn’t a pirate but a privateer commissioned to hunt down pirates. In fact, he wasn’t ruthless as history makes him out but a family man with a wife and daughter living in a fine house on New York’s Wall Street. The Pirate Hunter is both a masterpiece of historical detective work and a high adventure, as exciting as any Harry Potter movie. A book readers will find hard to put down.